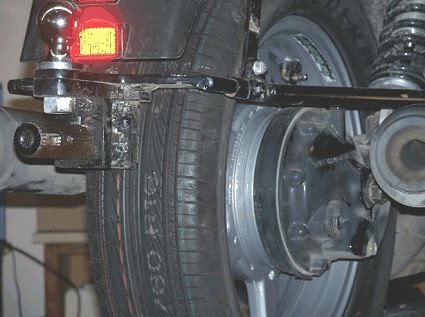 In order to use a Car Tire or CT on a ST1100 you need to convert to the Honda GL1500 wheel as there is no CT to fit the ST wheel. The G1500L axle, spider, and splines are the same as a ST1100. You want to be sure to get a later model wheel. The early ones had 4 drive fingers on the spider, the ST1100 requires 5 fingers. If you check with a place that does trike conversions they will likely have some. Or look on flea-bay. You will see prices all over the place but I got mine for a reasonable price. $49 plus $20 shipping. 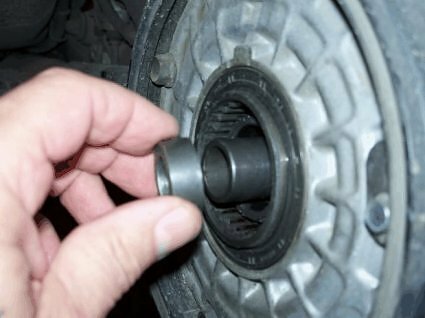 NOTE: If you purchase a used GL1500 Rear Wheel, make sure to check the bearings or replace them since mileage would be unknown. Rider will provide the stock or E-bay hanger and the boss the forward pin goes through. All years appear to be the same. I need to mill some off the hanger to allow it to move left. I need to remove the steel bushing. I need to make new bushings to allow the move to the left and to go back to stock if a CT isn't for you after trying one. Finally, the boss that the forward pin goes through to keep the hanger in position, needs to be milled. I take off 0.250" to allow the shift to the left. 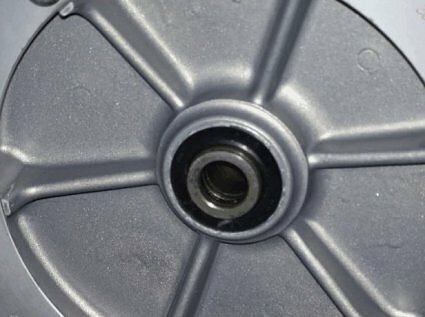 Using a cross-reference fiche as a guide, it can be determined that the same drive flange is also used on a Honda, GL1500, 1988-2003. 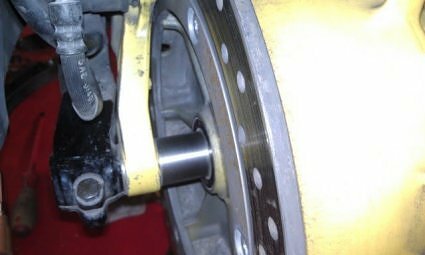 One can then accurately assume the GL1500 Rear Wheel ( 1988-2003 ) will fit the ST1100 Drive Flange ( 1995-2002 ). There are not that many choices for the 1100 as we need to stay with a narrower tire than the 1300 can use, because of the swing arm clearance. 175/60/16 is as big as has been used at this time to my knowledge. Trekker Dave Rear Formoza 175X60X16 40 PSI 6,000 Cranked up the pre-load & damping on my Progressive Suspension rear shock. Bigmak96 Rear Bridgstone Turanza 175X60X16 38 PSI 7,500 I am happy so far. I am sure there are many riders who feel this is not the thing to do. I would like to thank those riders for allowing us to go to the "Darkside" with what has been a minimum of public ridicule. 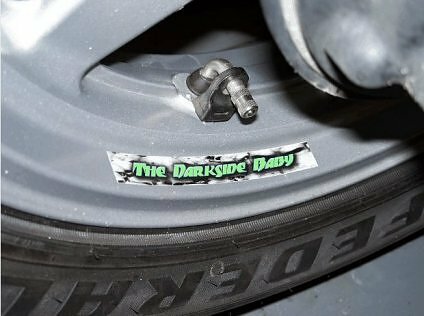 I will be the first to say, it should not work as well as it does,and it sounds like a very stupid thing to do when you think about what a car tire looks like compared to a standard motor cycle tire. All I can say is it does work. If you have doubts about it, by all means, don't do it. 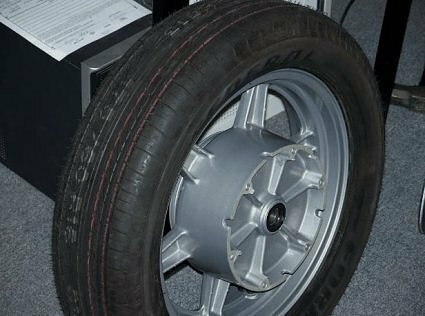 If on the other hand you are curious and would like to see what it feels like, I am sure most guys running a car tire would be happy to let you take a spin on their bike. It does feel different, but so does every new tire I have ever put on. It was surprising to me how quickly the difference felt like the norm. Getting huge mileage makes that difference worth it to me. So, with that out of the way, here is what it takes to run a car tire on the ST1100 without ABS. You need to use a wheel from the later offering of the GL1500. Those bikes used the same 5 pin spider we use in our final drive. Use your bikes original spider if the wheel you find has the spider with it. Don't introduce a different wear pattern with a different spider! The GL1500 wheel is not as wide as the stock ST1100 wheel either in rim width or measured over the bearing faces. Given that fact, the wheel needs to move to the left to center the wheel with the bike. 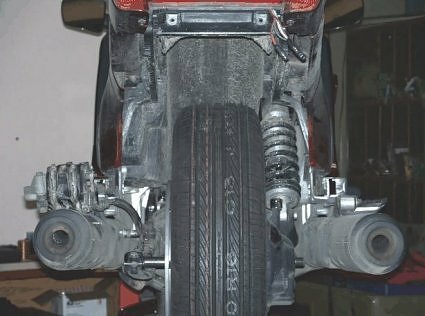 To do this, there are some spacers needed, and some alterations to the brake hanger that need to be done. These sizes are not set in stone, but are what Dan Foell, aka The Dan, STOC #7982 determined to be correct to get the proper shift to the left. I say not set in stone because there is some leeway allowed. 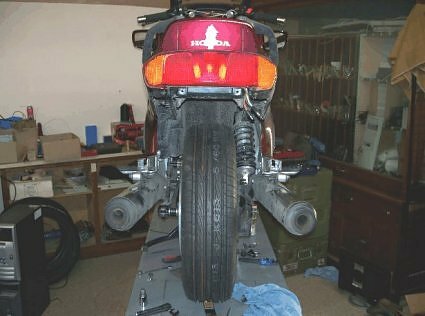 It would be possible to make the total width too wide to fit between the swing arm, and that would not work, but being less wide would be fine. 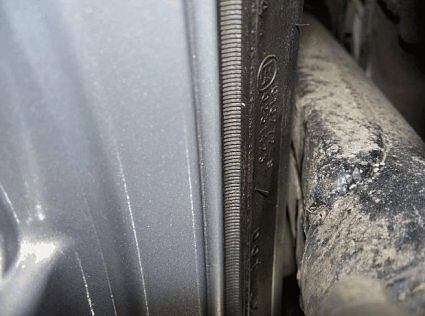 I would guess you would be hard pressed to tell if the axle were pulled another 0.050" to the right when you tightened the axle nut. 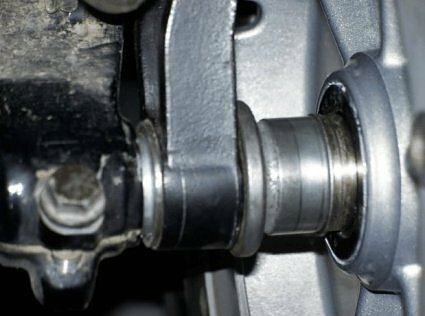 And since the shoulder of the axle pulls everything together when the nut is tightened, I feel it would be a moot point. These are ALL the parts needed or need modified to convert the ST1100, without ABS to accept a Car Tire. TOP is the modified caliper hanger. 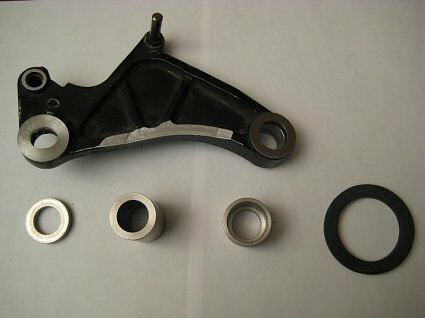 Below on the LEFT, Item #1 is the caliper hanger shim, second from the left, Item #2 is the left side axle spacer, third from the left, Item #3 is the right side, spacer tube extension and finally, on the right, Item #4 is the replacement thrust washer. (1) The thin nylon washer that goes into the spider is replaced with a 0.25" wide replacement. 0.25" X 2.46" O.D. X 1.75" I.D., Item #4. 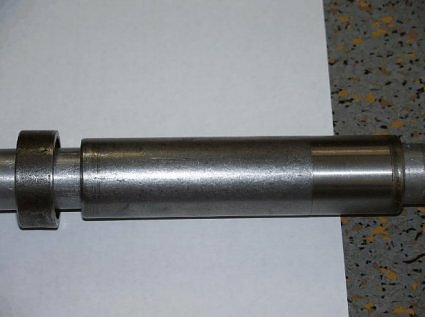 (2) The spacer tube that extends out of the final drive is extended by a piece that slips over the O.D. 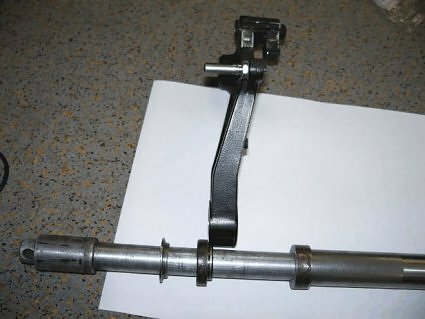 of the spacer tube. 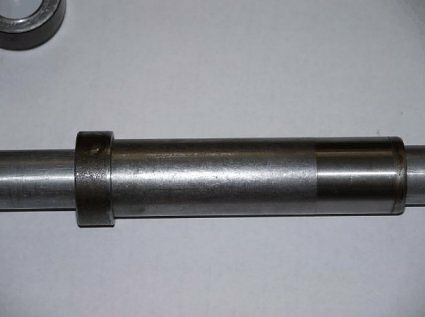 This piece has a 0.22" shoulder that butts up to the original spacer tube. Item #3. I made mine 1.25" O.D. with an 0.805" through hole. The 1.030" I.D. that slips onto the spacer tube stops short of going through, creating a shoulder of 0.220'. This shoulder is what makes the wheel move to the left to accommodate the GL1500 wheel. OK, the wheel is now shifted to the left. 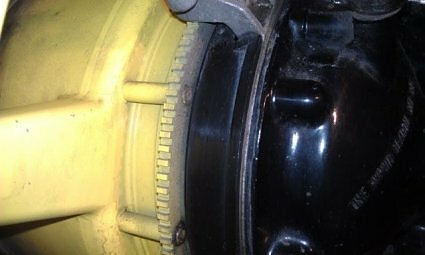 The next steps are needed to accommodate the total width of the wheel and get the brake hanger in the right plane to get the pads where they need to be. it is 1.540" long. The O.D. is 1.182". 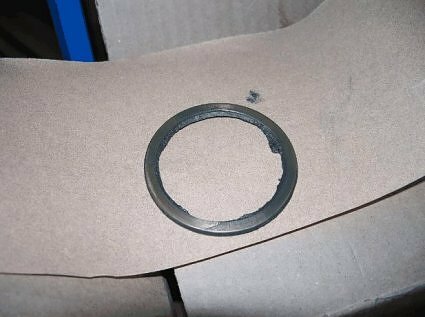 This fits snugly into the dust seal of the bearing. The I.D. 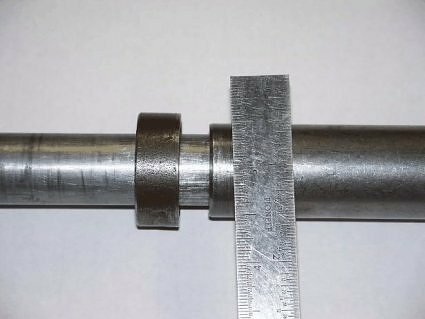 is 0.79" or a close slip fit to the axle's O.D. 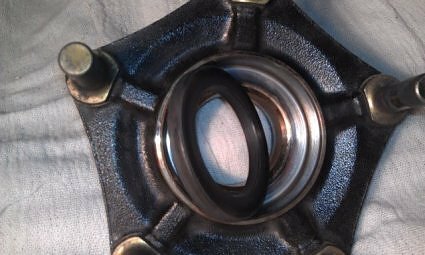 thus keeping it concentric with the bearing and seal. Item #2. Those are the three spacers needed. 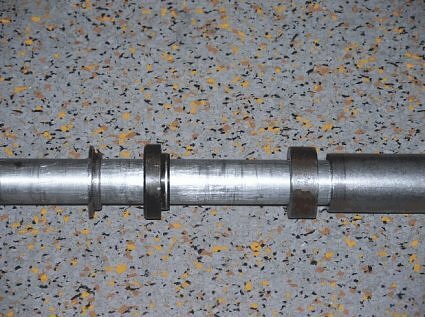 This picture shows the two axle spacers together. The one on the right is the one that slips on the end of the stock spacer tube in the final drive. The other just to the right of the hanger is the spacer that goes between the wheel and the hanger. Now for the brake hanger alterations. 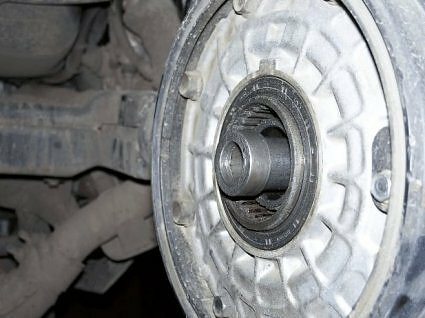 Given that the brake disk is not in the same plane that it is with the stock wheel, the hanger needs to make a shift to the left as well. This is done one of two ways. 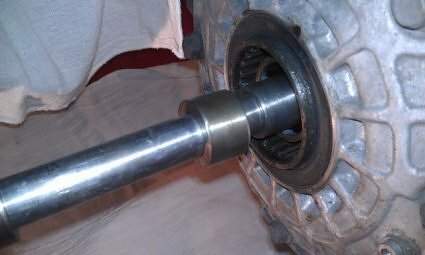 Either you can heat up the hanger to allow you to get the steel axle bushing out and then replace it with one with a thinner flange, or you can have your local machine shop mill off some of the original bushing. If you choose to mill the original and leave it in, another spacer will need to be made so in the event you want to leave this crazy Darkside, you will be able to put your hanger back in it's original position. If you leave it in, you need to have 0.230" milled from the original and make a spacer 0.230" thick to put in if you want to go back to stock. This leaves 0.062" of the original flange, which lets the hanger move to the left by 0.230". Item #1. 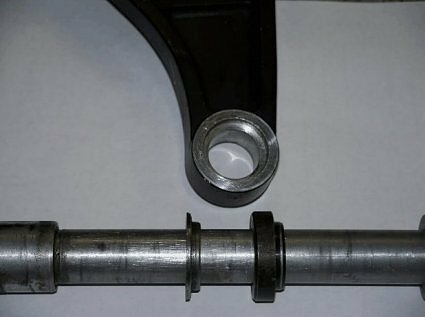 If you take the original steel bushing out, you need to have a replacement made that has a 0.062" wide flange. It is more work doing it this way as you have to turn just a little off the small diameter of the original, so it can slip back into the hanger if you go back. 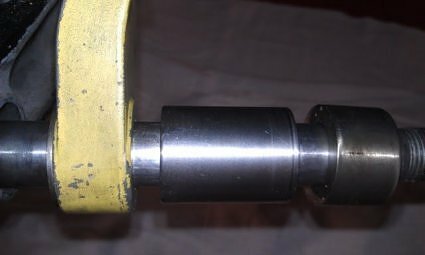 The new one with the 0.062" flange needs to slip into the hanger where the old bushing was. I did mine this way but will opt for the additional spacer method in the future. It was way more work than it was worth. The shift to the left makes it necessary to mill some material from the lower rib on the brake hanger so it can rotate into position. I wish I had exact info on that but I don't at this time. If I do another conversion, I will try to document it better. The picture above shows where to do it. It's not real important how much, other than it needs to be enough. ;>) If you can do, or have done, the other work first, you can put your axle through the hanger and rotate it down to see where and how much to take stock off. One final step. the boss that the forward pin goes through to keep the caliper hanger in position, needs to be milled. I took 1/4" off it to allow the shift to the left. That is it. You can now install your GL1500 wheel. If you have an ST1100, with ABS, there is another rather major hurdle to get over. The pulse ring needs to be mounted on columns to get it in the right plane. I will pass on explaining that now, but I will if there is an ABS owner that needs to know. The pictures do show what needs to happen. I want to stress that I am NOT trying to drum up work here. It really is kind of a PITA to make the parts and do the milling so it is not something I am trying to stay busy with. I would much prefer to talk to your local machine shop to answer any questions so you can have it done locally. For what it's worth, the ST1300 is a much easier platform to work with. They can just mount a tire. Test fit. Needs to move left 7/32. The shim for the flange to keep the splines in the correct place. yup molly on it. Spacer slips on the factory spacer. The spacer in place. moves the wheel 7/32 over. 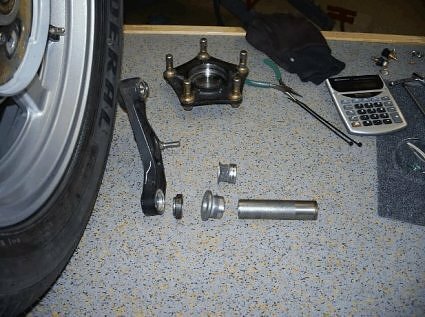 Used the stock spacer and the spacer that came with the Goldwing wheel + .35 shim. Will machine the correct spacer now that I know what it needs. It slides this far over. Took out the thick spacer drove in the thin. Took 7/32 off the caliper mount. made a spacer for the drive side. Plenty of room after the move over.